I made you a diagram. I hope you find it enlightening. The format was, of course, shamefully ripped off from Indexed. Organized with a funky librarian flair! Your Tiny Top Hats diagram tickled me, so I will give you my mathematician's interpretation. In mathematics, such a picture is called a "Venn diagram"and is used to illustrate intersections of overlapping sets of objects. 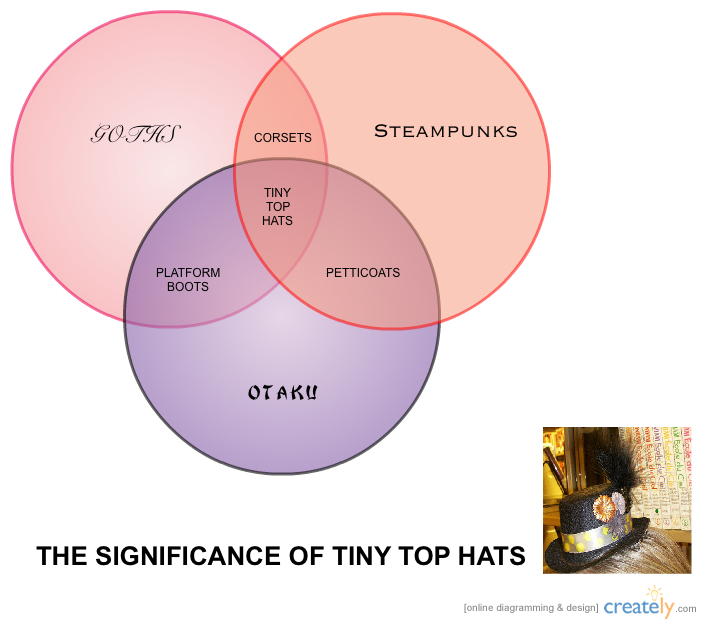 In this particular diagram, we have three set (Goths, Steampunks, and Otaku)and we see the intersection of each pair of sets and the intersection of all three. For example, each corset is a Steampunk and a Goth but no corset can ever be an Otaku. Of course, every Tiny Top Hat is a Steampunk, and a Goth and an Otaku. Although you might not have intended such a literal interpretation, this is how a mathematician would see it.